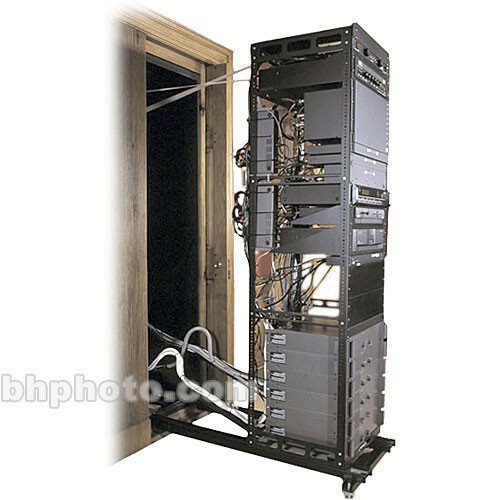 This Middle Atlantic AXS System for Millwork and In-Wall AXS-35 is a versatile, high-capacity rack that offers unrestricted rear access to equipment and cabling. Rack mounts on cable tracks and service stand (not included) to create a pull-out frame (48" length extension) that reduces time and labor. The extension can be disconnected for storage. This rack is ideal for flush, in-wall mounting or with the use of custom molding or panels to conceal rack when not being used. All steel construction and mechanically interlocking corners guarantee exceptional strength and years of use. This construction, with heavy-duty, 13-gauge steel top and bottom panels, supports up to 650 lb. of distributed equipment with a total rack capacity of 35U. And a durable, black, powder-coat finish offers a clean aesthetic look perfect for any work environment. Rack mounts on pull-out frame with 48" extension to gain quick, unrestricted access to equipment.